New York City isn’t the sort of place that immediately springs to mind when one thinks of walking but the city is a treasurehouse for urban exploration. Walking – with a little bit of assistance from the city’s comprehensive bus and subway system – is by far the best way to get under the skin of the ‘Big Apple’ and, to squeeze the life out of this hackneyed metaphor, who knows what you might find – pips, juicy flesh, maybe even a worm or two?Unlike many American cities, where the assumption is that people prefer to move around in noisy mobile metal boxes, New York is a relatively pedestrian-friendly place. For a wholesome, petrochemical-free experience, there’s always Central Park, but for the past year or so there has been another traffic-free route through Manhattan’s West Side that has transformed a pre-exisiting industrial conduit to a green pedestrian byway. 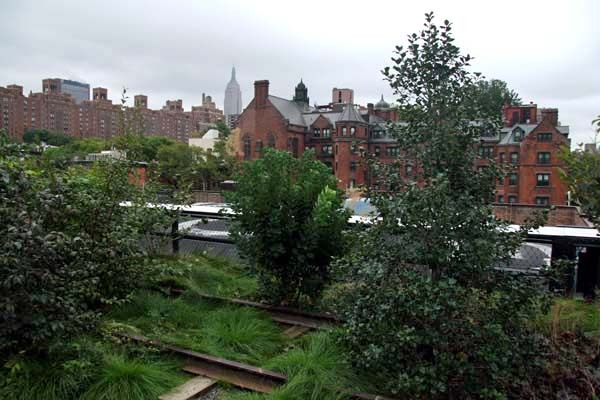 New York’s High Line, a mile and a half of raised walkway above the working class neighbourhoods of the West Side, was once part of an elevated railway that was built in the 1930s to shift goods to and from the slaughterhouses and packing plants of the Meatpacking District around Gansevoort Street. Defunct by the mid 1980s, the rail line has since been lovingly transformed into a fine green artery that links that same meaty neighbourhood with West 34th Street in Hell’s Kitchen to the north. In place of sleepers and railtracks a landscaped walkway now threads along its length, which is lined on both sides by plentiful benches and seating areas, and long leafy borders filled with grasses, perennials and shrubs. To add a bit of glamour, the Empire State Building peeks above the surrounding city roofline at regular intervals as a reminder that Midtown’s architectural bling is really not so far away. The real beauty of the High Line is that it does not really have any specific sight to see at either end – the Meatpacking District was never a big tourist draw, although the neighbourhood is currently on the up and being gentrified faster than you can say ‘sushi bar’. Sometime in the future there will be a new American art museum built at Gansevoort Street but, for the time being, rather than any particular goal, the attraction is the High Line itself – the walking of it. What better way to take in the city than to stroll above the streets and buildings where New Yorkers actually work and play out their lives? 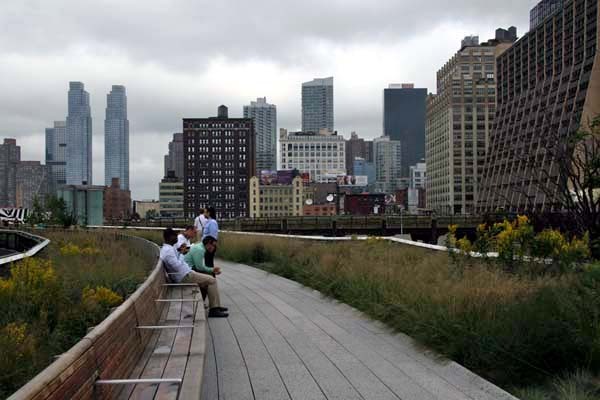 Technically speaking, the High Line is an urban park rather than a mere thoroughfare. Its not just for tourists but a place filled with office workers eating sandwiches and friends taking a stroll together – native New Yorkers looking down on the streets they have known all their lives and seeing them from a fresh perspective. It is also quite remarkably crime-free. 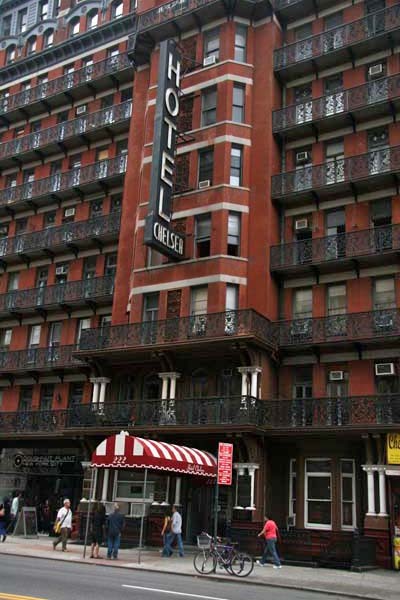 Halfway along, just south of Hell’s Kitchen, the route runs through the West Chelsea district and anyone wishing to pay homage to Sid Vicious or Dylan Thomas (who both died here), or Jack Kerouac, Bob Dylan or Joni Mitchell (who all embraced its muse), could do worse than make a short pilgrimage to visit the famous Chelsea Hotel at West 23rd Street. Sadly, the hotel has recently been bought up by a developer and is no longer open to ‘receive new guests’, so artists, writers and rock stars in search of a creative Bohemian atmosphere or a suitable venue for high-spirited shenannigans are now obliged to look elsewhere. 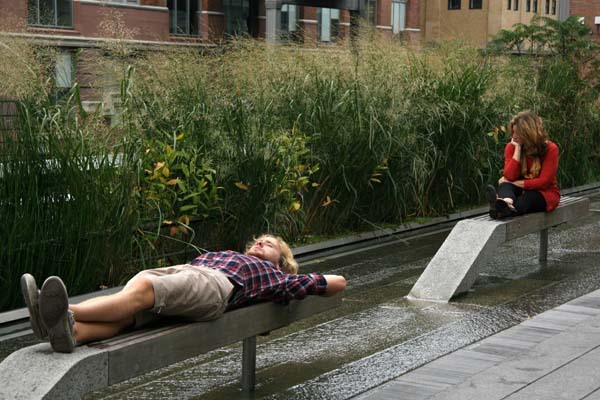 This entry was posted in Travel, Walking and tagged architecture, High Line, New York, railways, USA. Bookmark the permalink.